Nutro Wild Frontier Turkey & Chicken Dry Puppy Food is a high-protein grain free recipe that's highly nutritious and equally delicious. Made from fresh turkey & chicken - it's a taste your puppy will love! 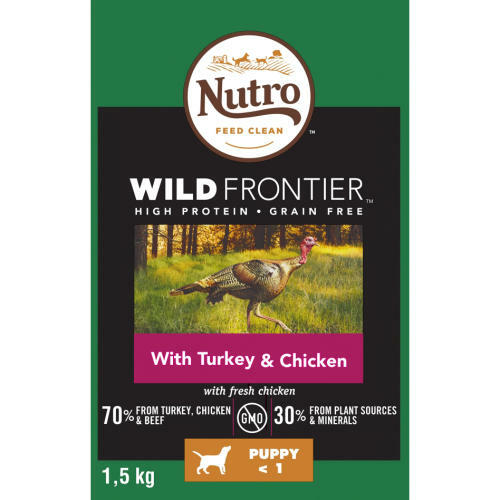 Nutro Wild Frontier Turkey & Chicken Dry Puppy Food offers a grain free, high protein food for your puppy that imitates what their ancestors would have eaten in the wild. Dogs experience rapid growth as puppies and protein is a key nutrient for them to grow healthy and strong. That's why our recipes contain 70% animal ingredients from high quality protein sources like turkey and chicken. We also include fresh chicken for a taste that your puppy will find irresistible. Feed your puppy what they instinctively desire.